GET READY TO JUMP! Black alert, otherwise known as alert condition black, was an alert signal used on the USS Discovery and the USS Glenn in 2256 to signify that the ship was operating its experimental spore drive. 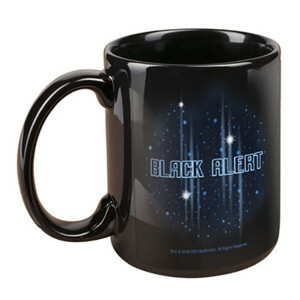 This Black Alert Mug is great for any fan of Star Trek Discovery. I didn't realize how small this was going to be when I purchased it! 11oz is a teeny tiny mug compared to what I usually drink coffee from. But, that's my fault for not checking the size before I ordered! I do wish the print was bigger across the mug. It's the same "black alert" logo on the front and back, but there's a lot of blank space where it could be enlarged. I mean, it's a fine mug, but it's not as awesome as I expected. Not worth the effort to return it, but I probably wouldn't have bought it if I saw it in person in a store.